If you have a friend who has everything—except time to do everything—Shock The Clock: Time Management for Writers and Other Creatives is the perfect Christmas gift. I found time—using her practical tips—to interview my witty and wise friend, Jeanette Levellie. Let’s not waste time. Give me the gist of your book in 15 seconds or less. If you got an A+ in procrastination, can’t find your car keys, and might need a lifetime pass to Clutterbugs Anonymous, you can benefit from this lighthearted approach to managing your time and getting more writing done. That was just 8 seconds. So, in the 7 remaining seconds, what will readers learn? I hope writers and other creatives—from artists to musicians to movie producers to Play-Doh sculptors—will be encouraged by God and my words that you can learn to manage your time, even if you were born disorganized and discombobulated like me. So let’s reset the timer and ask, What sparked your interest in this topic? I have learned over the years how to say no when I need to, how to manage small and large chunks of time, and how to pack the most into a day, but also how to relax and play. Some I learned from books, some from emulating organized people, and some from the Holy Spirit konkin’ me on the head. What person or thing has been most beneficial to your writing career? Fifteen seconds start now. God, since he’s the one who gave me a brain and all these zany ideas that turn into articles and books, but my biggest cheerleader is you. You published tons of my humor columns in the magazine Vista. Those columns morphed into my second book, The Heart of Humor: Sixty Helpings of Hilarity to Nourish Your Soul. Just having one person who knows the writing industry believe in your work makes the difference between barely hanging on and believing in yourself. Well, thank you. Discovering new, talented writers is the best thing about being an editor. You are one of my favorite humorists, but enough about me. What advice would you give to beginning authors? Don’t take rejections personally. I used to be crushed by rejection slips, but now I just move on. It’s not even about me as a person; it’s about what that editor likes, or his or her audience reads. But I do listen to corrections, so I can improve. I’ve also learned to cull out the passive verbs and write tighter, to keep the readers’ interest. I’d encourage new writers that it’s not always gonna be this hard. Just hang on awhile longer. I’ve never believed in “time management,” but I’ve always believed in self management. So, I’m taking time to recommend Shock the Clock, Jeanette’s warm, wise, and witty book on managing yourself while carving out chunks of time to be creative. And it’s short, so you do have time to read it! 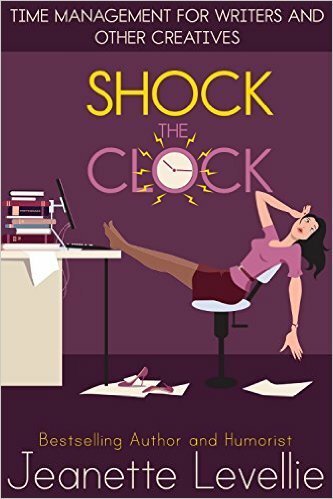 • Buy Jeanette’s Shock the Clock as well as her delightful The Heart of Humor and Two Scoops of Grace with Sprinkles on Top. If you found this post helpful, please share it on your social networks. Thanks! Thanks for having me, Jim! I hope your readers find my book as entertaining as I find your blog!